Although perimenopause is clearly the most noticeable stage of the menopause process, most women fail to realize what perimenopause really is. Perimenopause, as its own name suggest, is the time in women's lives near menopause. Symptoms such as hot flashes and mood swings appear, causing women to feel uncertain about their own bodies, as they go toward the end of their reproductive lives. Perimenopause, the second menopausal stage, is not something to be dreaded. Armed with sufficient and accurate information, the storm of perimenopause can be weathered with grace and relative ease. The following information provides a comprehensive definition of perimenopause, the causes related to its onset, the symptoms reported by women in this stage, and treatments for the many discomforts of perimenopause. Perimenopause can be a somewhat uncomfortable and even frightening time for women who are unprepared for the changes that accompany it. It is the second stage of the menopause process, and it can be recognized as the stage that signals the start of the end of the reproductive years. Although all women are different, they usually enter perimenopause in their forties. During this time, the female body prepares for the total cessation of reproductive functions, causing myriad changes and feelings. Follicle stimulating hormone (FSH) test. Testing FSH levels can help determine if a woman is perimenopausal, as FSH levels typically increase when women approach menopause. Estrogen test. Also called an estradiol test, this is performed multiple times over a period of several days to measure fluctuation. Thyroid stimulating hormone (TSH) test. This test checks for problems with the thyroid. To learn more about the different characteristics of perimenopause, click on about perimenopause or continue reading to learn about the different causes of perimenopause. Talking to a partner about perimenopause can be difficult, especially women who are experiencing it severely. However, this is likely to drive a wedge between you and your partner, so this article gives some pointers on how best to approach the discussion. Hormonal fluctuations result in the visible signs and symptoms of perimenopause. This involves the natural hormonal fluctuations that accompany aging and eventually lead to the end of the menstrual cycle. While all women experience natural hormonal changes, these changes can be accelerated or amplified by outside causes. These include poor lifestyle habits - such as heavy smoking - extreme stress, hysterectomy, and radiation or chemotherapy. For an extensive explanation of the hormonal and external causes of perimenopause, click on causes of perimenopause; otherwise, read on to discover the many symptoms of perimenopause. Perimenopause has a variety of symptoms associated with it, one of which is insomnia. However, there are many things that you can to to alleviate it. Read about the different stages of menopause, and how to battle insomnia during perimenpause. Although the symptoms mentioned above are the most common,there is a whole array of perimenopause symptoms. 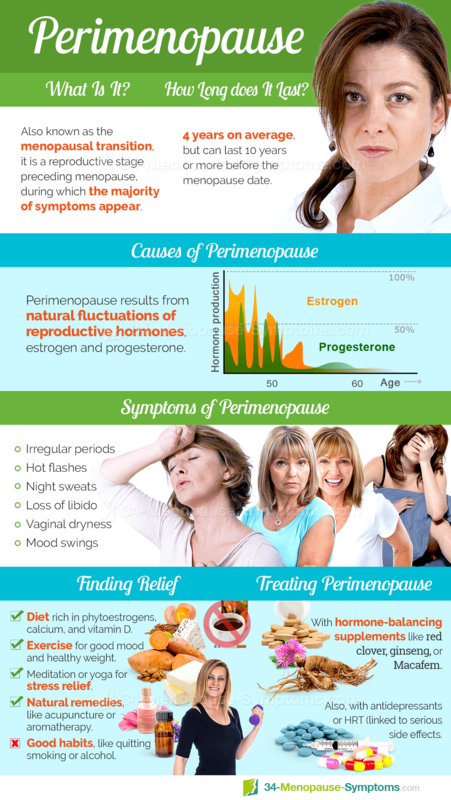 To get a better understanding of perimenopause symptoms, click on perimenopause symptoms. Many women might discover that their perimenopause symptoms are significantly disrupting their lives. These women might readily seek out treatments for perimenopause. Below, please find introductory information about perimenopause treatments. Perimenopause symptoms can include hot flashes, and sleeping problems, among others. It is important to try to maintain a healthy and active lifestyle in order to manage these symptoms. Exercising, eating healthy, and trying herbal remedies, can help. Although changing lifestyle habits is an effective approach, other women may need more powerful treatment options and seek out alternative medicine, such as safe and effective herbal supplements. Still other women find that they want even more powerful relief from symptoms and seek out prescription medication, which can be effective, but may not be totally safe. Because there are risks and benefits associated with some perimenopause treatments, women should consult a physician before committing to any course of action. While each woman is unique and needs to do research to find the most effective way to treat her perimenopause symptoms, many women discover that a combination of non-invasive lifestyle changes and alternative medicine are their ticket to symptom-free days. Please click on the following link to learn more about perimenopause treatments. Perimenopause can be a distressing time, but fortunately, it is possible to exert some control over it. This article gives tips on foods to avoid in order to prevent perimenopause from becoming unbearable. 09/28/2015 Perimenopause can be stressful time for women, as many symptoms, like hot flashes and night sweats, can leave them feeling unhealthy and run-down, and some even have more serious consequences. However, by managing the symptoms effectively and taking steps to ensure overall general health, a healthy perimenopause stage can be had. 02/11/2015 Junk food can be a real temptation at any time, but particularly during perimenopause, where you may be under a lot of stress or having mood swings, and want a pick me up. However, junk food can exacerbate negative symptoms in perimenopause, and should not be overindulged in. Click here to learn more. 12/11/2013 Perimenopause is the stage that leads up to the menopause transition. It is characterized by severe symptoms that are commonly associated with menopause, such as hot flashes and night sweats. Click on th following link to learn more about the causes, symptoms, and possible treatments of the perimenopausal stage. 12/11/2013 While many unpleasant symptoms, such as hot flashes, night sweats and mood swings, are associated with menopause, they typically begin during perimenopause. Perimenopause can take its toll, both physically and emotionally, so it is important to find support from your partner. Learn more about how to talk to your partner about perimenopause.